With four VMSL Premier teams involved in the Preliminary Round of the 2019 Imperial Cup last weekend, that made for a curtailed league schedule, with only three matches played in the top flight. But with one of those matches being a battle between the top two teams in the division, there was some tasty action on display. 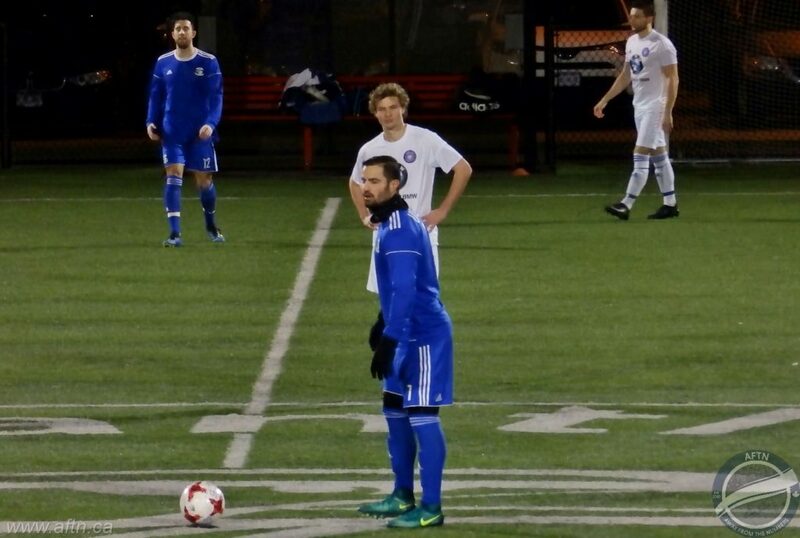 The match of the week was on Friday night at Newton Athletic Park in Surrey as CCB LFC United played host to West Van FC in a clash between the joint leaders of the Premier Division. 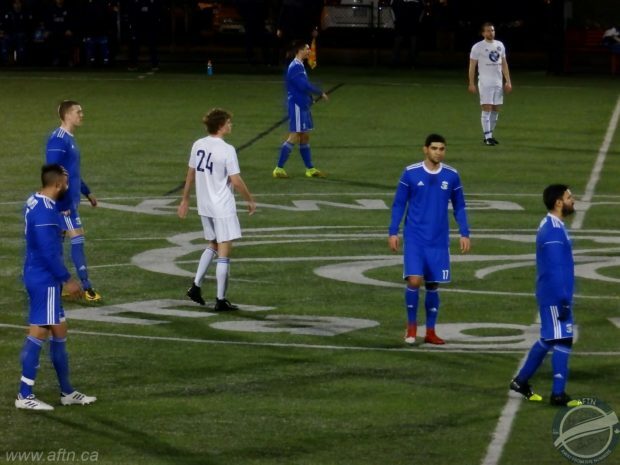 With CCB having a game in hand, it was as close to a must win match as possible for West Van if they were to keep their title aspirations alive. You felt it was either going to be a cracker of an attacking battle with both teams going gung-ho or a cagey affair with defences to the fore. And while the match did start with both teams feeling each other out, we never really got to find out what kind of match it would have been as the game changing moment came in the 16th minute when West Van were reduced to ten men after Michael Winter was sent off for a last man tackle from behind as Milad Mehrabi raced in on goal. It was a clear red card offence. Two minutes later, after all the hullaballoo had died down, former Whitecap Yassin Essa stepped up and fired home a beautiful 20 year free kick that beat the diving West Van keeper all ends up as it flew into the postage stamp corner. It already felt like a long way back for the Amblesiders but to their credit they had the better of the game for the next little spell before the rest of the half fizzled out a little and CCB went in with the one goal lead. The home side started the second half stronger, going for the killer second goal, and they got it six minutes after the restart when Essa ran in on goal and finished from the edge of the box. That was pretty much game over after that and although West Van did have a few forays forward, they rarely threatened the CCB goal and the Surrey side could have added to their tally from a number of the numerous chances they had. The didn’t, but held out comfortably for the 2-0 win in the end. You can see both the goals, and some of the other highlights, in our video below. That victory has CCB in pole position to clinch the Premier Division title, giving them a three point lead over their nearest challengers, with a game in hand and just three matches of their season remaining. It’s all in their own hands now. While the rest of the division need CCB to slip up, Croatia SC could be the team with the best chance of thwarting them. Croatia have three games left as well, and they sit five points back of CCB, with the two teams meeting at Burnaby Lake this Friday. A CCB win and that could very well see the title heading their way. The other two Premier matches played last weekend also had big implications in other regards. The battle for the six available VMSL Provincial Cup spots is looking likely to go down to the wire. The top four in the Premier standings are guaranteed a spot, along with both Imperial Cup finalists. If either of those finalists is a top four side then the 5th and then possibly 6th placed VMSL side in the league standings will qualify. And that could leave last year’s VMSL Premier, BC Provincial Cup, and National Challenge Trophy treble winners, BCT Rovers Tigers United, out in the cold depending on how their season plays out. Rovers Tigers headed to Trillium Park on Saturday afternoon to face Rino’s Tigers and came away on the wrong end of a 4-0 thumping. Carson Buschman-Dormond put Rino’s into the lead a minute before half time. Declan Rodriguez doubled their lead in the 53rd minute, and Ahmed Alghamdi added a third a minute before the hour mark. The points were already secured, but a last minute goal from Omar Soliman put the cherry on top for Rino’s, moving them into second place in the standings, three points back of CCB but having played a game more. 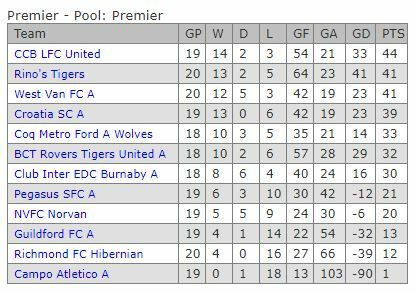 Rovers Tigers now sit in sixth, with four matches remaining. 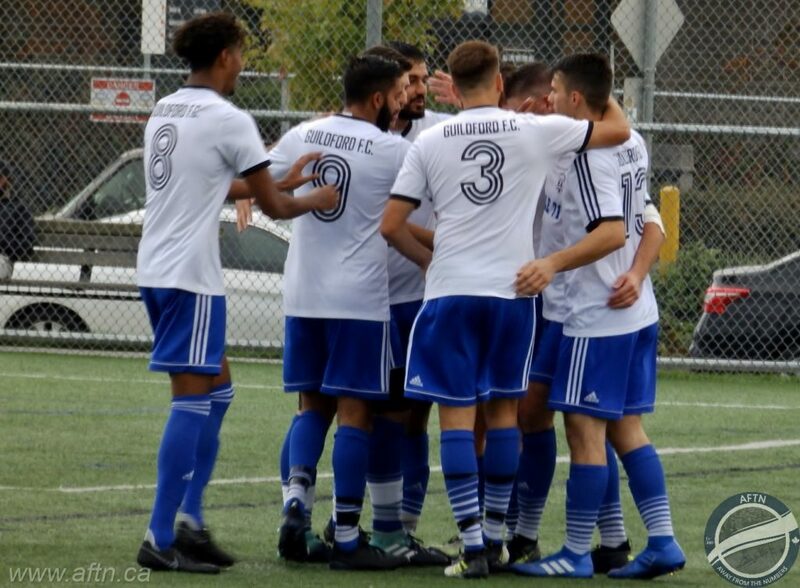 Twelve points off first and seven points off fourth, with Club Inter EDC Burnaby sitting just two points behind them in 7th, they’re in for a testing time to get back to the Provincials to try and retain their crown. The final Premier match of the weekend saw a relegation battle at Newton on Saturday evening between Guildford FC and Richmond FC Hibernian. One of these teams will be going down to Division 1 come the end of the season, and Guildford now control their own fate in their hands after a dramatic, last gasp 3-2 victory. Richmond headed into the match with a two point advantage and sitting just above the drop zone, but with Guildford having a game in hand. A win for either side was going to be massive and it was Richmond who took the lead two minutes before half time through a Trent Lebans goal. That lead was to last just two minutes, with Dipinder Gill levelling for Guildford to send the teams in all square. Gurinder Pannu fired Guildford into the lead three minutes after the restart, but Brad Caldwell got Richmond back level in the 53rd minute. All to play for, and both teams had their chances to win it, but as the match headed into stoppage time, it looked like a share of the points was on the cards before Pavan Singh grabbed a dramatic winner for Guildford, moving them out of the relegation places and putting Richmond’s Premier future in a lot of jeopardy. You can find all of this week’s fixtures, plus results and standings across all seven divisions, on VMSLsoccer.com. And don’t forget to check out the Take The Piss forums for all your local football banter and Canucks4Ever’s weekly match previews and predictions.